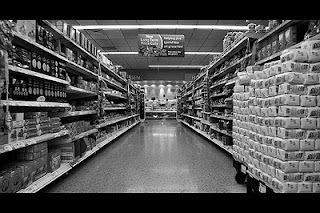 One of the worst things that can happen to me in a supermarket is that I would meet an old friend or acquaintance down along the aisles. The very worst thing that can happen to me in a supermarket is that I would meet an old friend or acquaintance in the very first aisle. Don’t think me anti-social (although I am, a bit), I’m as happy to meet old friends and/or acquaintances as the Next Man. Hell, I’m as happy to meet the Next Man as the Next Man. Just not in the supermarket. Please. Picture the scene: You’re wheeling your trolley along Aisle Number One – Fruit and Veg – when you spot somebody who you half-know frowning over the aubergines. Could it be? Yes it is. It’s Martin, Good old Martin. You decide you will draw alongside his trolley with your own and surprise him with some carefully selected epigram along the lines of ‘Howiya, Bollix’. You mentally rub yours hands together in juvenile glee. Then you remember the last time, and the time before that and, thinking better of the entire proposal, you attempt to slip past Good Old Martin, Ninja-Fashion, without being seen. Too late, I’ve been spotted. Supermarket conversation may be occasionally passable but it is rarely earth-shatteringly good. After a subconsciously-specified period of inane chit-chat, it’s time to plug the ipod buds back in and roll on toward the cleaning products aisle. Persil and Tide wait for no man and all that hahahaha… yes, bye. Onward hastily through the supermarket, for there are still fourteen more aisles to navigate. “And therein lies the rub,” as Hamlet, (our local masseur) used to say. You know it because you’ve lived it yourself. Yes, Martin – Good old Martin – will be in every one of those fourteen aisles, waiting for me. He won’t want to be. He’s not a stalker or anything. In fact he will be trying his damnedest to not see me in the shop ever again. But it can’t be done, we are now destined to meet in every aisle for the rest of the shopping expedition. The first aisle after we meet will not produce an actual meeting. We will both see each other and we will both double-back to avoid passing each other again. That is the fatal flaw – we have both now broken our routine route around the supermarket in order to avoid each other. Order has been abandoned and the laws of Chaos have now come into play. The result will be that we will miss key elements from our shopping list and, of course, we will be destined to meet and meet and meet again. It probably isn’t so bad for you guys, this repeated interpenetration of shopping routes, but I have a condition which exacerbates the problem greatly. It's simply this; I always have to say ‘Hello’. Yes, I know, it’s tragic, what can I tell you? I struggle on, it’s all I can do. The point being that, every aisle we meet in, I have to say ‘Hello’ again to Good Auld Martin (the Bollix). You would probably carry it off with a smile or an enigmatic twitch of the right eyebrow. Not me. I have to speak, to come up with something different in each aisle. Martin is one of those people, like you, who doesn’t need to speak at every encounter. Every time I meet him and greet him with another ineptitude, his face darkens and his general demeanour becomes ever more murderous. Whatever tenuous friendship Martin and I previously enjoyed, it has seriously withered on the vine by ‘Tea and Coffee’ and has been buried deep in the cold cold ground and stamped-upon by the time we cross paths once more in ‘Household’. By the time the checkout is achieved, and we line up at our adjacent conveyor belts, we are sworn mortal enemies and we will never actively seek each other out socially ever again. Plus I forgot to get the Weetabix. I feel awkward reading this.. ..so true! Like saying hi to someone early in in a night out in the pub and being in the same urinal routine. Penises and lack of washing hands ten times more awkward. ..
Seoirse: Thanks mate. I kinda thought that standup thing too, glad you seconded it. Thanks, as ever, for stopping by. My shopping dilemma is slightly different. Everywhere I turn, little old ladies or husbands who look lost say to me, "Excuse me, do you know where the (fill in the blank) might be?" Hahaha. I tinternet shop for most of my groceries. Supermarkets make me grumpy. Also there's no one to judge the stash of chocolate I've ordered. Er for Christmas of course ... honest. It has been years – literally years – since I even met anyone I know in the street, let alone in a supermarket. That’s what happens when you move away and start a new life in what, at least according to the Glasgow Street Atlas, is off the grid. Literally, my house is just off the map. The street is there, it just ends before you get to my place. Which is fine by me. I have no burning desire to meet anyone from any one of my disparate pasts again. But I have been where you’ve been on too many occasions being the kind of man, at least I used to be, who actually enjoyed the whole shopping experience. I still do in principle. I just can’t be bothered getting out there and doing it. Carrie places orders online and a nice man lugs all our stuff up the stairs and deposits it at our front door. (We don’t actually have a back door, seeing that we live on the first floor, but it feels odd just calling it ‘the door’.) Nowadays it’s rare to find me in a supermarket other than our local co-op down the hill and as I know no one from around here that I would recognise bar our next door neighbour who I’ve never seen walk any farther than from her flat to her car and back I’m fairly safe there, besides it only had four aisles and if I did meet her there she’d probably give me a lift home. I don’t think we’ve done a proper weekly shop in a physical supermarket in eight years, at least, probably more like ten because I can’t honestly remember doing a shopping when we lived in the Gorbals. Strange world we live in now. Haha! I thought it was just me. For the precise reasons you've so wittily outlined I ALWAYS go to the supermarket in disguise (never without big hat pulled down to almost cover eyes and often with my driving glasses) and NEVER make eye contact with anyone. If I do get spotted, then after the inane pleasantries I skip an aisle, then go back at the end. I think this stems from a bad experience when I was a student. I bumped into a bloke I had a serious crush on and the only item in my vast trolley was a bumper pack of bucket-sized Tampax. I still blush, just thinking about it. Good piece Ken. The perennial problem of old friend recognition. Rose coloured glasses tempt you to speak, but actual recollection drives you away.